Visit one of the world's most spectacular ecclesiastical buildings in Spain. Enjoy an unforgettable tour with an official guide. 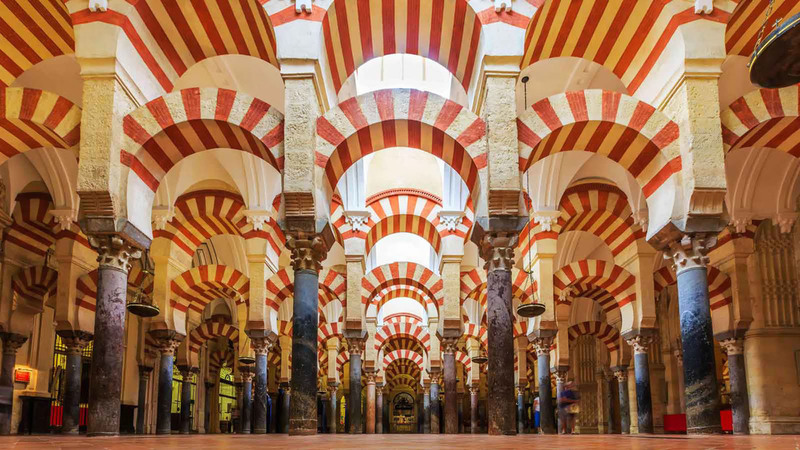 Book our special tickets and admire the stunning beauty of the Mosque-Cathedral of Córdoba during this 1-hour guided tour. Meet our official guide tour, discover the secrets of this incredible cathedral and experience a masterpiece that combines Christian and Arab art. In fact, That is considered one of the most important expression of the Arab and Islamic art and, nonethless, a great work of Gothic and Renaissance Andalusian Art. It was originally a Christian Visigoth Church dedicated to Saint Vincent. When Muslims occupied Córdoba, the building was split in two parts in order to be used both Christians and Muslims. Subsequently, Emir ʿAbd al-Raḥmān ibn Muʿāwiya ordered to tear down the Christian Church in order to build a proper mosque. The Mosque-Cathedral is shaped like a quadrangle from around 130 metres in width and from around 180 metres in length. It included 19 aisles and 856 columns with different styles of capitals. You will admire the Main Altar of the Cathedral built in 1627 which is similar to the altar made by Juan de Herrera for the Church of the Monastery of San Lorenzo de El Escorial . Don't miss the maqsuramihrab (apse) with other decorative highlights. In 2010, the Spanish Bureau of Engraving and Printing dedicated a Commemorative 2 Euro coins to the Mosque-Cathedral of Córdoba: a fair tribute for one of the most incredible Spanish monuments of all time. Please, come prepared and we recommend wearing comfortable clothes and shoes. • Correct dress code is requested to enter the monuments. It is not permitted to enter with tank tops, strapless shirts, short shorts or sandals. Patio de los Naranjos, next to the radioguide Vox office. Look for the guide with the blue umbrella.